If you’re like me, when you get to a new National Park, it’s a bit overwhelming. Unfamiliar places, unexplored trails, and a bunch of names that have little meaning to you. After hiking every mile of trail in Glacier National Park in 2011, I had people emailing me asking me for advice. I would help them out, but really wanted to find a tool that would be helpful and one that they could take with them on the trail. On my honeymoon in Maui my wife and I had a frustrating time using the maps, guides, and handouts to ineffectively drive the Road to Hana in Maui (we finally got to the Bamboo Forest as it was getting dark…. boo!). I constantly saw people doing a similar wandering along Going-to-the-Sun Road and decided to take all of the good parts of these maps, guides, handouts and put them into one cohesive piece, coupled with my recommendation. 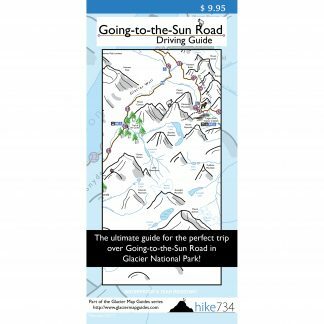 So I created a map with a guide on the back called the Going-to-the-Sun Road Driving Guide. It was a fun map with not only the recommended stops, but with the right order to get parking spots in congested areas and better photos. Basically, the insider’s take on driving the road, as if I was in the seat next to you. 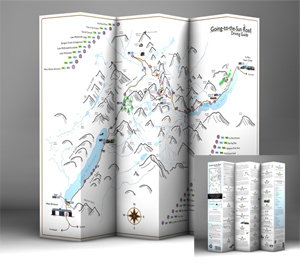 The following year, I had my next breakthrough in creating a similar map with a guide on the back for day hiking in Glacier. 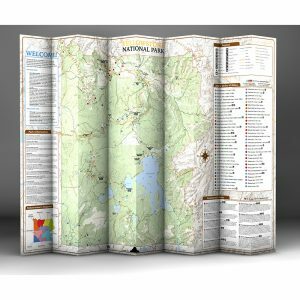 I learned how to make professional topographic maps, identified 88 day hikes, and gave my recommended order. 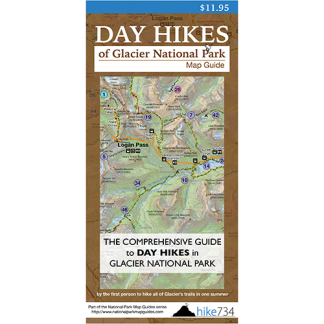 The Day Hikes of Glacier National Park is the most comprehensive map and guide out there while being the most approachable and user friendly available for Glacier. People have really loved it where I sold over 6,500 in the first year. 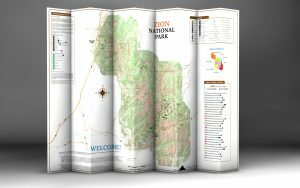 Due to the success of the Day Hikes of Glacier National Park map guide, I decided to see if there was a similar need down in Zion National Park, so I hiked down in Zion in 2014 and have come out with the new Day Hikes of Zion National Park map guide. Glacier Map Guides are guides created by me, Jake Bramante of Hike 734. They are a map on one side with a corresponding guide on the other side working in perfect harmony. 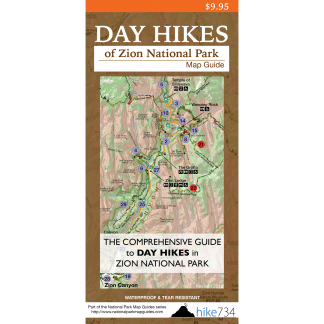 The Driving Guide will get you zipping around like a Red Bus tour operator while the Day Hikes Guide will have you picking hikes like you hiked all 734 miles of trail in one summer! Glacier National Park’s one million acres of rugged beauty are laced with 734 miles of trail. From dense forests to windy peaks, finding the right trail for you, your family, or your friends can be tricky. 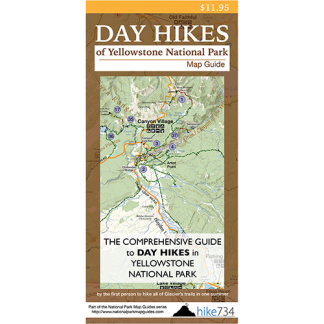 After hiking all the trails, people are always asking Jake, “Where should I hike?” thus this guide was born. Unlike a map that just shows you where the trails are or a guidebook that gives you an encyclopedic list of hikes, this map guide was laid out to help you decide which trails to explore using distance, slope difficulty, and Jake’s recommendations. Jake has identified 88 hikes and sorted them from the trails he would recommend you to hike first to the last one he’d have you try. Trails are organized by distance on the guide side. On the map side, you can find the complete list of hikes in order with which ones are better for families, open for earlier season hiking and which ones have bathrooms of some sort along the way. On the map itself, the trails are color coded for when the trail is level (green) to a little bit of up and down (yellow) to steep hiking (red). All of these come together to help you decide what hike you should venture out and explore! Head on over to the store to order yours! At the heart of Yellowstone National Park lies a volcano. This has shaped everything from the hydrothermal features to the mountains, meadows, streams, and wildlife. There are over 1,000 miles of trail to explore and one of the best ways to see it is on foot. 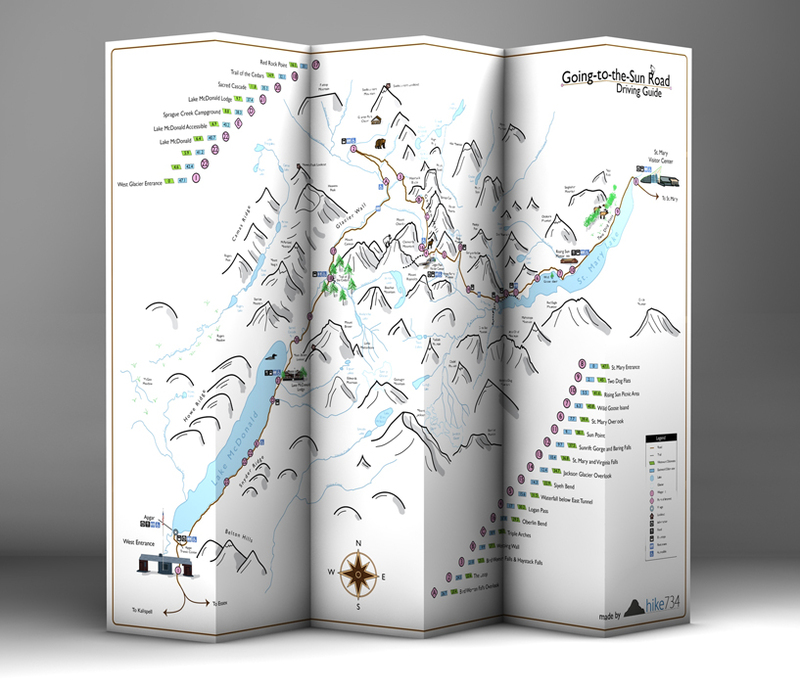 Unlike a map that just shows you where the trails are or a guidebook that gives you an encyclopedic list of hikes, this map guide was laid out to help you decide which trails to explore using distance, slope difficulty, and Jake’s recommendations. Jake has identified 65 hikes and sorted them from the trails he would recommend you to hike first to the last one he’d have you try. Trails are organized by distance on the guide side. On the map side, you can find the complete list of hikes in order with which ones are better for families, which are accessible, and which feature steep dropoffs. On the map itself, the trails are color coded for when the trail is level (green) to a little bit of up and down (yellow) to steep hiking (red). The Virgin River in Zion National Park has created absolutely incredible features that are begging to be explored. From the tall walls of the Narrows to standing eye to eye with Peregrine Falcons in the middle of Zion Canyon on Angels Landing, you will be blown away at every turn. 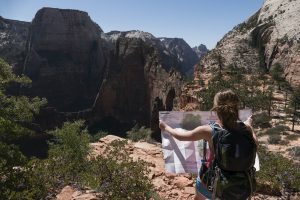 While most of Zion’s visitors simply explore hikes off of the Zion Canyon Road, numerous other day hiking exists in the East Rim, Southwest Desert, and the fantastic Kolob Canyons area. Where will you explore? 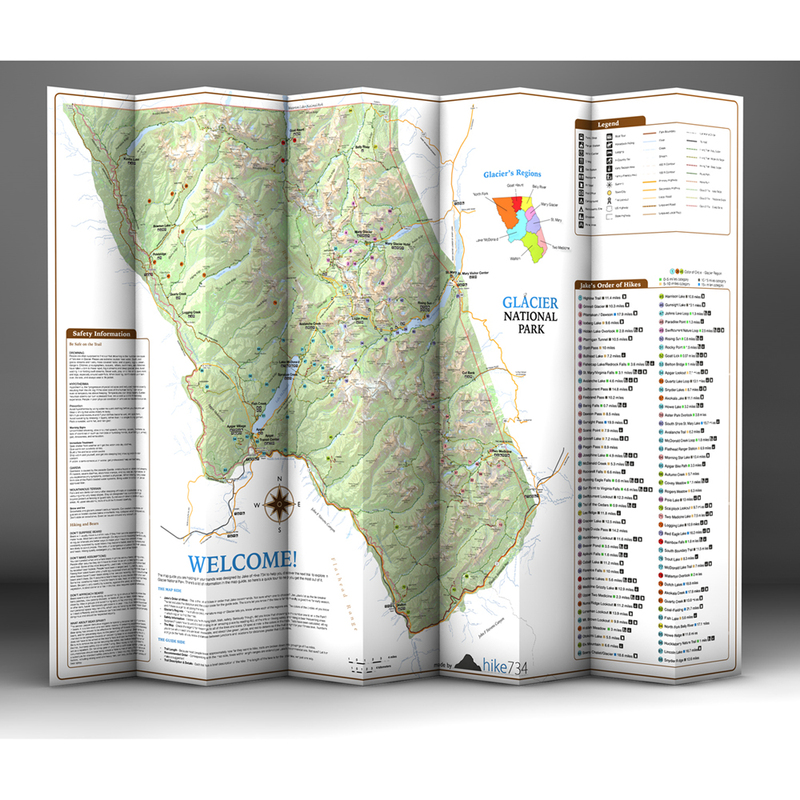 Unlike a map that just shows you where the trails are or a guidebook that gives you an encyclopedic list of hikes, this map guide was laid out to help you decide which trails to explore using distance, slope difficulty, and Jake’s recommendations. Jake has identified 29 hikes and sorted them from the trails he would recommend you to hike first to the last one he’d have you try. Trails are organized by distance on the guide side. On the map side, you can find the complete list of hikes in order with which ones are better for families, which are accessible, and which feature steep dropoffs. On the map itself, the trails are color coded for when the trail is level (green) to a little bit of up and down (yellow) to steep hiking (red). There is a reason why driving the Going-to-the-Sun Road is the most popular activity in the Park. It’s something that everyone can do and it is, frankly, incredible. We realized that there are better ways to do this and people don’t want to miss the good stuff. 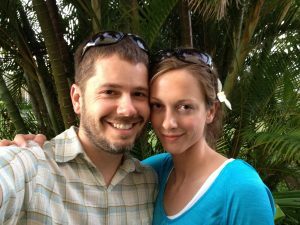 Inspired by a drive on the famous “Road to Hana” in Maui during his honeymoon plus the kinds of questions he gets from his blog, Jake dreamt up this guide. He wanted to put together all the stops that he would make and the order so that people could get the best possible pictures and, hopefully, a chance to park in the Logan Pass parking log which fills up quickly. In order to do this, he drove the road many times pulling out at every stop, marked out all the mileage and figured out the sweetest way to do it. If you don’t have one, head on over to the store or pick one up at one of these fine retail outlets! Why no outlets in Great Falls? We are a short two hours+ from the Two Med area! I thought that I’d responded to your comment, but alas, I hadn’t! You can pick up the driving guide in Great Falls at Bighorn Outdoor. I’d just not updated the page, but your message helped remind me! So, thanks!